In an effort to keep insurance premiums affordable for Americans, the Affordable Care Act made enrolling in an approved health insurance plan mandatory for everyone. Failing to enroll meant fines that averaged $625 a year as of 2018, and some people have had to pay thousands of dollars. But Congress enacted the new tax law, and provisions within the ACA were eliminated, namely the individual mandate. Since then, four states reactivated that mandate: New Jersey, District of Columbia, Massachusetts and Vermont (in 2020). Maryland, California, Connecticut, Hawaii, Minnesota, Rhode Island and Washington are also considering such measures, although nothing has been put before the respective state’s legislative committees to date. Why Did ACA Have Mandates, Anyway? Major health insurers were inclined to stay in each state’s ACA exchange (where customers shopped) with a mandate because it gave insurers a more balanced mix of healthy and sick customers. Traditionally, new enrollees with no health issues pay smaller premiums, whereas customers with pre-existing conditions paid slightly higher. By endorsing a mandate, premiums would stay consistent across the board because insurers could balance premiums between sick and healthy buyers. However, the results have been skyrocketing rates for everyone. At this point, it is not uncommon for a family that does not qualify for a subsidy (only available to those earning less than 400% of the federal poverty level) to pay over $2000 a month for coverage. The good news is that without these unneeded mandates, options are more plentiful now than before. When 2019 rolls around, those options will continue to grow. One popular option that’s been consistent for over 20 years is the health care sharing plan. 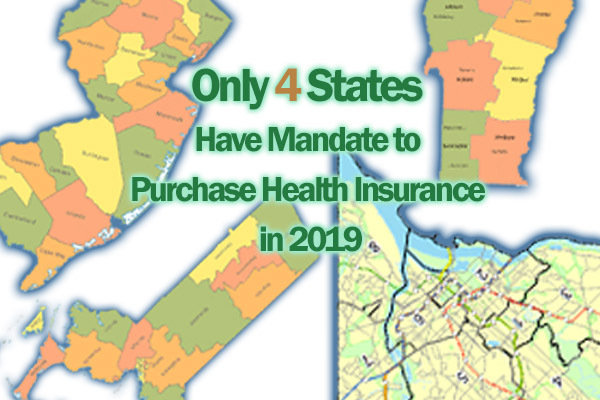 Regardless if your state adopted an individual mandate, members of health care sharing plans are always exempt from mandates to purchase health insurance, as specifically written into the Affordable Care Act. With health care sharing plans, you’re not bound by federal and state insurance regulations as it’s not actually an insurance policy but rather a faith-based pool where contributions are made then used when conditions arise. More importantly, the monthly cost on these plans is substantially lower than health insurance plans. These plans are not for everyone because they do have some restrictions on pre-existing conditions, but for many, they offer excellent coverage at substantial savings. It’s always ideal to review options outside of traditional health insurance prior to committing to one. While many people have turned to health care sharing plans over the years, short-term plans may be suitable for people transitioning from one carrier or plan type to another. Another risky option you’re entitled to choose is going without coverage. While the monthly out-of-pocket costs are zero if you stay healthy, the long-term risks of not being insured include paying full price for medication and routine doctor visits, and risking bankruptcy should a serious medical condition occur. With hospital costs higher than ever and some medications costing $1,000 or morea pill, can you really afford to do without some type of coverage? If you’re unsure whether insurance or a health sharing plan is right for you, or need help deciding, experts can always review options with you. Interested in learning more about health care changes in 2019? Call us at: 800-913-3416 for a consultation with one of our personal benefits managers to get a better understanding of the available options, including more information about health care sharing plans.